The day dawned bright, clear, and cold. 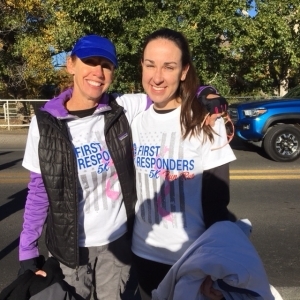 “Perfect running weather,” said Christina Sheehan, Modrall Sperling shareholder and Race Director for the fourth annual First Responders 5k. Unit after unit, troop after troop of law enforcement officers, firefighters, paramedics and those who support them showed up in waves for the yearly event that benefits New Mexico Ten-82, a fund that benefits public servants and their families. Sheehan and Robin Hopkins, a retired Bernalillo County Deputy Sheriff, started the October event in an effort to celebrate and bring together first responders and the communities they serve. It was in October of 2013 that Robin was shot by a man who had already wounded three officers earlier that day. She fought for her life, and during her long months of recovery, began to fight for something else: Healing her city as well as her body. Modrall Sperling has been a sponsor of the race each year since its inception.